“How do I know this mattress is supporting me in the right way?” is one of the most important questions we get at The Natural Sleep Store. Many of our customers come in concerned about pain while they sleep, and stiffness when they wake up. When picking a new mattress there are key factors to consider. The mattress you choose should not only be comfortable (and organic), but also supportive to your body to allow restorative sleep. Posture is an aspect of life we are told to think about while we are going about our day. Interestingly, it is also something that is important to consider for the hours we are sleeping. When laying down on a mattress we encourage our customers to acknowledge all their main load bearing joints. Those include shoulders, hips, knees, ankles, and how the neck is supporting the head. These joints are very important because they are our main joints that deal with our continual battle with gravity and motion. When looking at the figure of the standing lady you can see that you can draw a straight line from the center of the ankle all the way up to the shoulders and head. You can think of this figure as the original ‘blue-print’ design for the body. 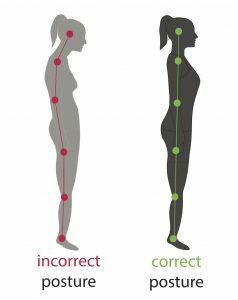 With how much sitting and asymmetrical motion society requires of people today it is very uncommon to find a person with perfect posture. The more awareness of our posture that we bring into our daily activities, and sleeping position the less pain we experience. When the main load bearing joints are in alignment your muscles can remain in the proper tension. This concept allows the muscles to activate and relax as they were meant to. On the other hand, when our joints are misaligned then particular muscles must work extra hard, while other muscles get lazy and weak from not being able to do their job. This same notion applies to our bodies when we’re sleeping. If the joints are not aligned during our hours of sleep we will wake up with some muscles that worked very hard over the night resulting in tightness and stiffness. For instance, if a person tends to sleep on their back and they have a mattress that is too soft and allows their hips to fall below their shoulders and knees, they can very likely wake up with lower back tension. This is because some muscles are forced into a very long tension, while some are forced into a very short position creating difficult tension for any joint to adjust to. 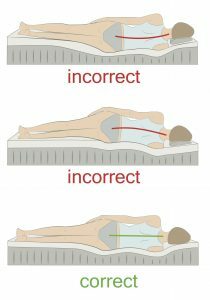 Similarly, if a side-sleeper is using a very firm bed they may experience some pressure points due to their hips and shoulders not aligning properly. When you are shopping for a new mattress, you want your body to line up. If you are a back or stomach sleeper, have someone take a picture of you from the side while laying on the mattress. The ankle, knee, hip, shoulder and neck joints should form as straight of a line as possible. Ensure that the mattress is soft enough or firm enough for your backside or belly to sink in just enough. You wouldn’t want to bow downwards, or upwards if the mattress is too firm or too soft for your body type. If you are a side sleeper, have someone take a picture from the back. You want your hips and shoulders to sink in just enough so that your spine stays straight. You may need to place a pillow between your knees to keep your knees in alignment with your hip joints. If you are shopping online, and don’t have an organic mattress store near you, consider one of our adjustable mattresses made from different layers of latex with different firmness levels. These mattresses come with a comfort guarantee or latex exchange, so if the firmness level you first choose doesn’t keep your body in alignment the way it needs to be, you can exchange or purchase a different firmness level to adjust your mattress. Our favorites are Bella Sera Nove 3, Sleeptek Kama Flex Lift, or the Green Sleep Dolcezza. Taking it even further is the Green Sleep Ergo 8 and Ergo 9. Here, the latex can also be adjusted from head to foot, with different firmness zones for the head and shoulders, the torso, and the lower body. For example, if you are a side sleeper and have very wide shoulders, you may need a mattress that is softer at the head of the bed and firmer in the middle and foot. One of these fantastic mattresses would let you achieve that. Additionally, to keep your body in alignment, it is very important to consider the pillow that you are sleeping on. For example, if a back-sleeper is using a pillow with very high loft, it is likely forcing their neck to remain in a ‘forward-head’ position (the head is forward of the shoulders) throughout the night. It would not be a surprise if this person woke up with neck tension, or aches elsewhere. The pillow used should allow the head to line up with the other load-bearing joints below, meaning the ears are aligned with the shoulders, hip joints and ankles. For a back sleeper, this will likely be a thin pillow that provides neck support, but does not place the head forward. 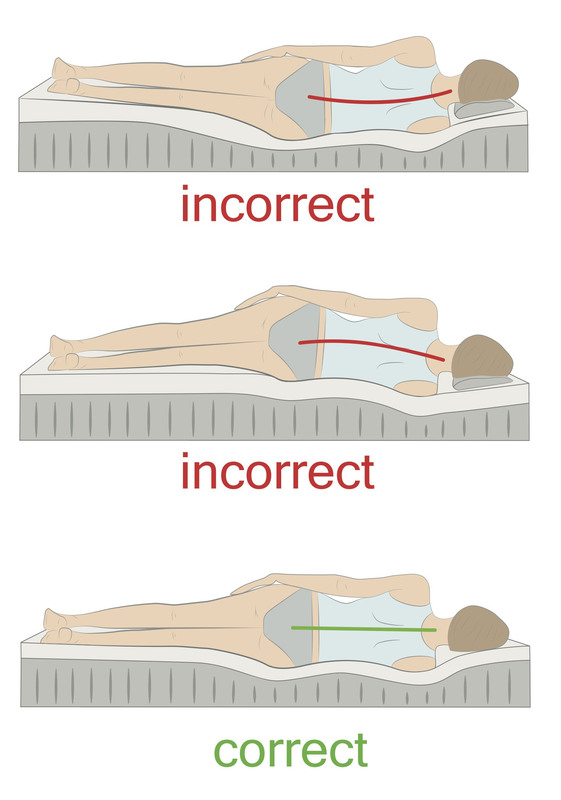 For a side sleeper, a pillow should be the right height to keep the head in a position that the spine will stay straight, without the head cocked upwards or downwards based on too thick or thin of a pillow. Our adjustable pillows, especially our Suite Sleep Wooly Bolas or Suite Sleep Shredded Rubber pillows are wonderful, as there is a zipper to add or remove loft according to the height you need the pillow. It is no secret that we have more conscious control of our posture while we are awake. Though, we do believe that if you set your body up with the proper support during sleep by choosing the best mattress and pillow, you can give your body a better chance at fully restoring and wake up feeling great.